Below is the website for Patriots4America.com. This is the project that Mitchell Mason (Founder) and I have been working on. Mitch and I are trying very hard to reunite our beloved nation. 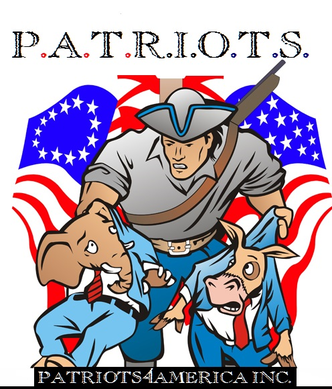 I joined Patriots4 America after the fraudulent 2012 Presidential Election last November..
Patriots4America.com has applied for the 501 c(3) and have most of it accomplished. It will take another month or so to complete the process. Until the donation logo up on the Patriots website works, Donations can be mailed to P.O. BOX 422348, Kissimmee, Fl 34741-9998. Donations will pay for the logistics, guest speakers/performers et al. We will have busses to and from local airports. We are also hoping to have rental wheelchairs for our Veterans (included in the donation). And we have sent invitations to Senator Ted Cruz, Glenn Beck, Mark Levin, Dr. Ben Carson, et al. Patriots4America Walk in D.C at noon on 09/11/13. Our missions are located on the website. Please help us reunite our beloved nation! For when we reunite as one voice, we can put God back in the schools we choose for our children. When we reunite as one voice, we will heal the wounds Barack Hussein Obama had inflicted on our beloved nation. When we reunite as one voice, we can put an end to the murder of our unborn. When we reunite as one voice, we can become “One Nation Under God, Indivisible, with Liberty and Justice for all”…..once again! I am honored and humbled that Senator Ted Cruz, Rep Craig Bowden, Michelle Malkin, Sharren Angel, and several other prominent conservatives are following Patriots4America. Please join us to reunite and renovate our beloved nation! May God bless our beloved America!